Please refer to our stock # 3229 when inquiring. 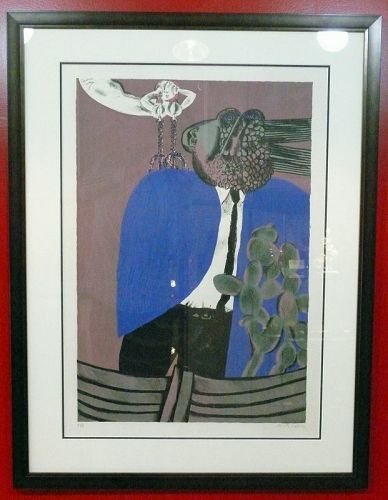 Naftali Bezem, Artist Proof Signed Color Lithograph, Man, ca. 1970. Framed in wood with bronze tint. In excellent condition. Frame size 34" x 26". Lithograph 26 1/2" x 18 1/2". Naftali Bezem was born in Germany. He is best known for his symbolic renderings of the Holocaust and the return of Diaspora Jews to the Land of Israel that appear in memorial reliefs at Yad Vashem and in the Israeli President’s Residence in Jerusalem. Bezem immigrated to Israel in 1939, at the age of fourteen, before the outbreak of World War II. A member of the vibrant generation that built the state of Israel, his early adolescence was spent under Nazi oppression, in refugee camps and in constant fear for the safety of his parents, who later died in Auschwitz. This personal history largely shaped his artistic style and work. Bezem views art as an expression of the soul of a people, it’s heritage, and it’s truth. He has won several prestigious prizes, has been shown internationally in a group and solo exhibitions including the Venice Biennale and the Sao Paulo Biennale, and has taught at Bezalel Academy in Jerusalem.